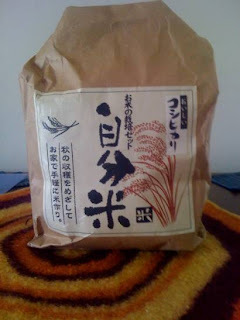 Tokyo Green Space did a post not so long ago about finding a rice-growing kit at Donki, a totally weird and wild discount store chain. Inspired and intrigued, I started looking about for one of my own. I found another kit at Ito Yokado, a fancy-ish department store, plus a variety of others for growing everything from lemon grass to tomatoes to strawberries. Since I can't read Japanese, I imagined it would be too big or too difficult to grow on my own. I did, however, mention it to the farmers. Shee-chan wanted a rice field (tambo in Japanese) of her own ever since I told her of our adventure planting a field with One Life Japan last spring. Takashi-san had only smiled at the thought, so she was out of luck. The kit seemed like a perfect solution. Well, on a recent trip to Donki I wandered upstairs to help a friend looking for a humidifier. There, at the end of an aisle clustered with a bunch of other kits for edamame (in a beer mug, no less! ), parsley, and other vegetables was the original rice kit. My tambo, it seems, had found me. So, today with the farmers translating, we planted the tambo. (See photo at left.) 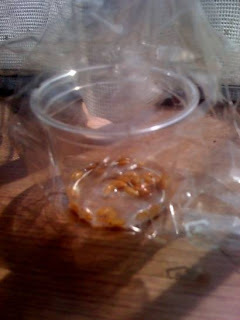 The seeds must soak half in and half out of water in a sunny location. The water needs to be changed once a day until the seeds sprout in three to seven days. (The cup, by the way, is about the size of the kind that comes with a bottle of cough medicine.) Once the sprouts arrive, the seeds are planted in soil that comes as part of the kit. Then we wait again until the shoots emerge. Eventually, the rice seedlings will make it to a larger pot where they will spend their days until it's time to harvest the grain. The kit gives directions for harvesting and polishing the rice, too. I'll keep you posted on it's progress. I hope you didn't pay too much. We always have tons of left-over rice shoots. I think they will survive a one or two day shipment. I can even send you some dirt and a box shaped like a tambo! Oh how fascinating!! I will definitely check back to see the progress. I would enjoy learning how to plant the lemon grass- as I use it in so much of my cooking. It was just under a 1,000 yen, Kevin, so not too bad. We're hoping to venture back up to help you plant again this year if you need it. The farmers want to come, too, if you've got space. What do you use lemon grass for, Anjuli? It always sounds delicious, but I don't know what to do with it. I could send you a kit! Joan-I use the lemon grass often to put into curry, stew, soups and often even in certain Asian cold drinks- it adds a nice flavor.